Short on time? This beginner friendly 5 minute workout is easy to do and perfect for on the go or travel. This 5 minute workout is designed for those that need a quick energy blast throughout their busy schedule. It requires no equipment, so you can do it anywhere, anytime. The focus is strength training for your upper and lower body through push ups and squats, while also giving you core and leg training with the mountain climber exercise. 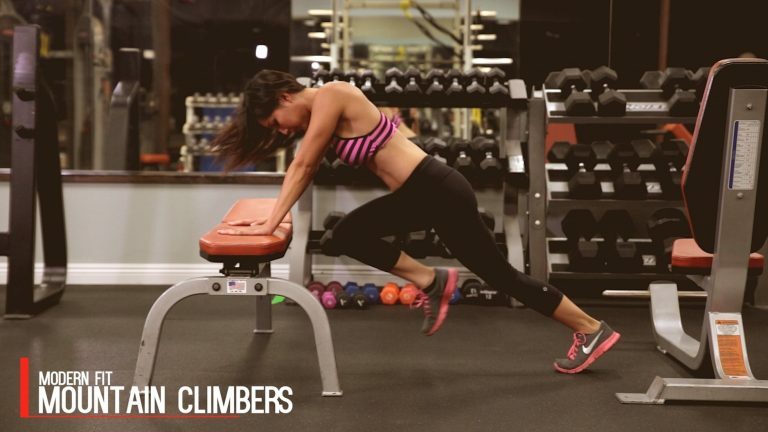 Mountin climbers will also give you a quick cardio blast to get your blood pumping. You can increase the speed and number of mountain climbers you do for the best blood pump and results. Limit the amount of rest in between sets to 5 – 15 seconds and rest between exercises to 5 – 10 second for the best results. If you find yourself having some extra time, you can also try out our 10 Minute Workout, which will give you even more target results, or you can simply increase your reps and sets. Start by getting into pushup position. Now kick one knee forward until it’s right under your hip or waist. Quickly move this leg back to starting position while also kicking your other leg forward under your waste. Repeat this aggressively to get your heart rate up and complete the set.